Low carb pepperoni pizza with a Fathead Crust tastes just like the real thing. 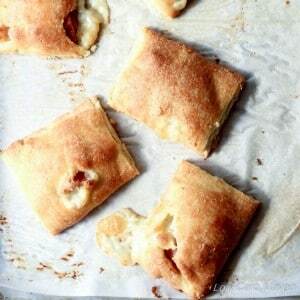 This easy mozzarella dough takes minutes to make and bake! One food I regularly miss on my low carb keto diet is pizza. But thanks to recent innovations in low carb pizza crusts, it’s back on the table – literally! 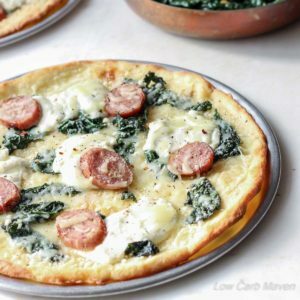 Low carb pepperoni pizza is my current favorite, but I am one who likes lots of gourmet flavors on my pizza so a nice Low Carb Sausage Kale Ricotta Pizza makes me equally as happy. I have enjoyed using this variation on the original Fathead crust by Cooky’s Creations. It’s extremely easy to make and calls for regular ingredients like almond flour, egg, mozzarella cheese and cream cheese. It makes a sticky dough but is easier to handle when cool and with oiled hands. I like add a little protein powder which I think improves texture, but it’s optional. We’ve had low carb pizza almost every week for Friday pizza night/ movie night with the kids. The most popular variety we’ve had so far is this all-American-classic, pepperoni pizza. My family loves it. This low carb pepperoni pizza tastes so much like the real deal that it satisfies those pesky pizza cravings. Of course it’s not going to have the exact texture as a real pizza, but it comes pretty darn close. The crust is thin and crisp and holds up well to toppings. Serve this great low carb Pepperoni Pizza with a nice big salad and you will be happy-happy! *This recipe makes one large thin sheet pizza, two 10 inch extra thin round pizzas or one 12-13 inch thin round pizza (shown). Try this Low Carb Pizza Pepperoni Pizza with Fathead Crust at 5 net carbs per serving! 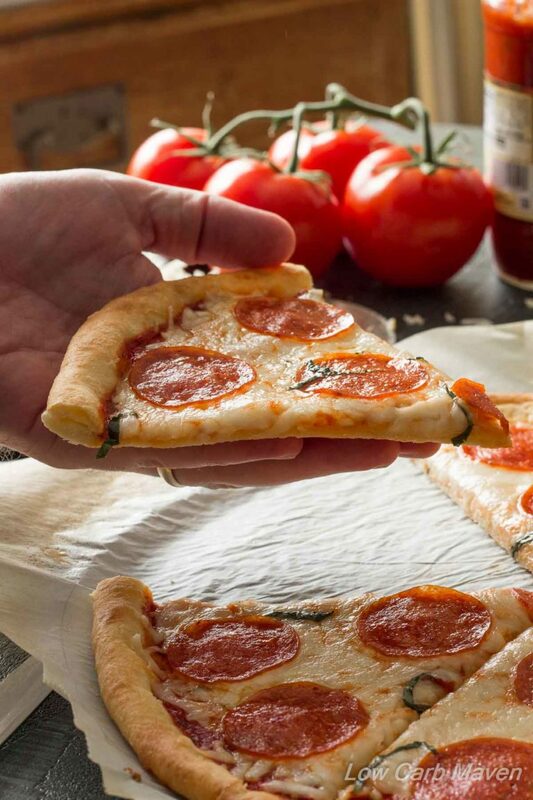 This low carb pepperoni pizza tastes just like the real thing with it's Fathead pizza crust. 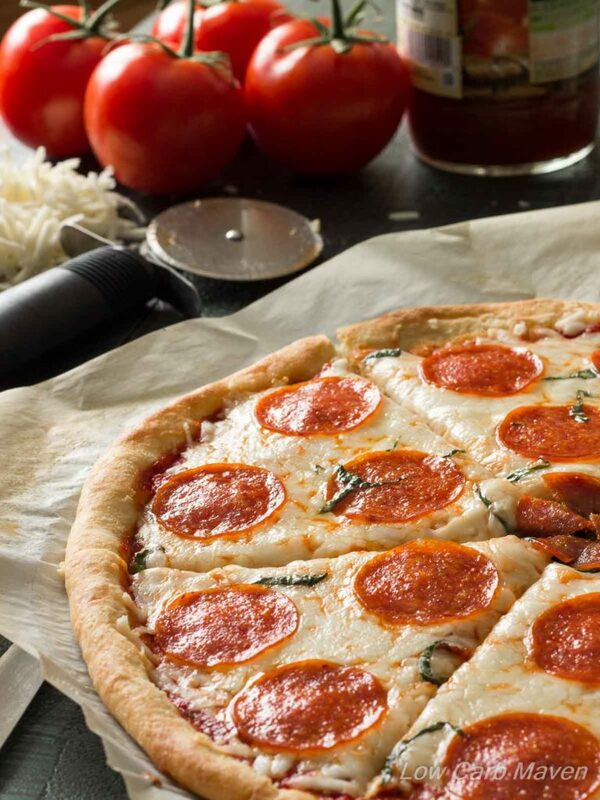 This easy pizza takes minutes to make and bake! . Makes 2 - thin 10 inch pizzas, 1 - thicker 12 inch pizza, or 1 thin sheet pan pizza (13 x 16 1/2). *** Pictures is a 12 1/2 inch pizza. Hi Kim! Great recipe! I was craving pizza and this totally took care of the craving. One question – I calculated the macros and my carb count for 1/6 slice is way off – I got 12g carbs and yours stated 6g. I followed your recipe to the T so I’m thinking the difference may be nutritional label difference between brands? The whole milk mozzarella I used had 1g carbs per 1/4 cup; used Bob’s Red Mill Almond Flour, Rao’s pizza sauce, Philadelphia cream cheese. Any thoughts on where I went wrong? Thanks! And thanks for a great recipe! Very yummy! I made a sheet pan pizza and it turned out fabulously! I used 2 Tbsp of coconut flour instead of oat flour and it turned out crisper than usual. This will be my go to pizza from now on! Hi is there supposed to be any kind of leavening in this recipe? Seriously – this dough and pizza is absolutely fantastic! I no longer miss pizza. Thank you! Actually the Fathead guys gave Cooky credit for the original recipe and said they had changed her recipe a bit to make it their own. Really good, very filling! Don’t need much to get full, it’s very tasty. I have just gone keto and finding these yummy looking recipes a little tricky because I have a nut allergy. Could I sub the almond flour with something else? Hi! I substituted the oat fiber for psyllium husk & used this recipe to make a stuffed crust pizza & this is the best pizza I’ve ever made! This will be my go-to recipe for pizza crust now because it’s crusty & flaky & very satisfying bites very much like a wheat flour crust, but way less carbs & gluten free! Dies this pizza do well in the freezer ? Just made this tonight and it’s delish!! I used 2 oz. Ricotta since I didn’t have any cream cheese, used Alfredo sauce since I was out of marinara, and I baked it all at once for 12 minutes since I forgot to bake the crust first. It tasted great but it stuck to my skillet like crazy, despite the skillet being covered in oil inside.. Ended up just having a pile of crust pieces and toppings on the plate. I wonder if the substitutions or baking it all at once caused it to stick like that? I’ll have to try again with the cream cheese in the crust and marinara sauce. OMG! That was incredible! When we order pizza, I usually scrape off the top and leave the crust, I will be making this often! Thank You! Made this last night and it was a huge success! My 19 year old son has been on a VERY strict Keto diet for medical reasons for more than 2 and a half years, and pizza is the thing he has missed most. We have tried other recipes that I couldn’t get him to eat because the crusts were so odd, but he could not stop talking about how much he liked this one! Thank you so very much! This was really good !!!!! Crispy crust & tasted wonderful! I will definitely make again !!! So good!! I couldn’t believe it! Are the nutrition facts for the entire pizza or one slice? 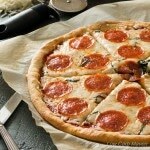 If you use whey protein isolate it should bring the carb count for the whole pizza to like 14 carbs. Which is significantly less. Is it 1 and 1/4 cup of almond flour or just 1/4? It is 1 and 1/4 cup. Let me know if you have any more questions! Any possibility of substituting Coconut flour for the Almond flour? Looks like a great recipe! I only have coconut flour in the cupboard. If not, I’ll just get some almond flour, but I figured it didn’t hurt to ask. I found a recipe that uses only 3/4 cup of almond flour and it tastes great. NO COMPLAINTS HERE! This was just perfect for us! Mine did not look as pretty as yours, but I did a rectangular crust. I used extra almond flour, since we don’t have the protein powder. I popped the dough into the fridge for a minute or two after mixing in the flour, and it handled nicely! Rolled it out onto my silpat and baked for 11 minutes (I rolled it to about 10×15″). I was really happy with the generous servings this made! THANK YOU for filling a void for our family! This bread….are you kidding me!?!? I needed a keto bread option for a buffalo chicken dip and came across this. I cooked it like stated and then cut it into chip sizes. AMAZING! I’ll try the pizza later on this week but I wanted to thank you. Literally the first comment I’ve left on a recipe/blog website. You deserve it. Is there a substitute for cream cheese that might be found around the house? A member of our family has an allergy but we’re not able to go out and buy anything special. I’ve been religiously doing keto for the past month and live within walking distance of some really great pizza places. I was on the verge of falling off the wagon and ordering “real” pizza, but luckily had all of the ingredients for this recipe on hand. This was so good and filling and so easy to make. Thanks for posting this recipe. Can you put ingredients on the raw crust & bake? I have tried this. No so great on a raw crust. I highly recommend cooking the crust first. Much more like a real pizza trust. I accidentally put the toppings on without baking the crust first, which is weird because I’ve made tons of iron skillet pizzas before and always baked the crust first. Still came out pretty nice after about 12 minutes, but it was almost impossible to get the slices out of the skillet intact. I had oil brushed on the bottom but it absolutely stuck all over like crazy! I wonder if baking the crust first would help that? I really want to make this but we have a nut allergy in our home, is there a substitute for almond flour? Thanks so much! Have you or do you know anyone that has tried to put this crust on a grill?????? I love grilled pizza crust and I am just getting ready to start a Keto diet for health reasons. Thanks……thinking I may try it……will let you know the outcome! Thanks for the response! Cook it on the grill, on a pizza stone! Hi How big is a serving? I use your low carb chicken parm recipe a lot, and noticed the link to this at the bottom. We’re a big fan of the fathead pizza around here, but I noticed your version had more cream cheese and almond flour than the original. Can you tell me what prompted the change, what one gets out of the different proportions there? Thanks, and really enjoy your site. Thanks for the response. I made the standard version tonight for dinner – which is what reminded me that I wanted to ask about this – and I might give your version a try next time. I like a crispy crust, and have a feeling this version might produce that. Any ideas for those that can’t have dairy . Like dairy free cream cheese as well as dairy free mozzarella cheese? Instead of oat fiber could I use psyllium husk, cannot wait to try this recipe tonight! Oh my gosh! I just made the pepperoni pizza and I can’t believe how good it is. My husband and I started a Keto lifestyle about 3 weeks ago, and most days we are good, but lately we’ve been wanting to have a non-“meat” meal, like pizza. This really hit the spot. Thank you, thank you , thank you. I can’t wait to try other recipes on your site. Hi, I used unblanched Almond flour and my crust doesn’t look anything like yours. Should I try another brand? Pretty good! Hit the spot. Tip, use cling wrap instead of parchment for the top layer, makes for easy peel off and can see dough as you roll out. Will be making this often! I also added a bit of sea salt to the dough. Thanks! Hi, I love this website and have tried several recipes with great success. However I’ve been choosing things I can reheat as it’s just me at home now. How do you recommend reheating this pizza? Hi there. Is the crust baked on top of the parchment paper? Hi, my son is allergic to almonds would soy flour work as a sub or do you recommend something else? Like Red mill low carb baking mix? I’m not sure what to use? Thank you. You left out the instructions on how to only eat one piece! Looks fabulous and I will be making this soon. Looks good! Is there another flour that might work? We have but allergies. Thanks! Are the nutritional values based on the whole pizza? This is such a great recipe. I wish mine looked as good as yours does. I rolled the crust and it worked very nicely. Thanks for the recipe! It has two oven times listed. So we preheat to 425, and then bump it down to 400? Or should it only have one temp??? HI there! Made this pizza tonight and it was amazing!! Thanks for sharing. Quick question- the nutrition facts you have listed, is that for the whole pizza for per serving? This looks awesome! What is the serving size for the nutritional value? This may be a dumb question but I can’t get access to pay fiber so I’m going to try using whey protein powder– however I can’t seem to find any non-flavored powders… do you think “natural vanilla” flavor will be okay?? Seems a little weird but not sure what else to do! Thank you! Made this tonight! OMG!! Where has this been my entire low carbing life!! Love love love it! So is this 321 calories per slice? Amazing! I have to be gluten free I recently started low carb due to my jeans getting a bit snug. As well as trying to avoid becoming a type 2 diabetic. I did 8 minutes and it was nice and brown but the bottom for us needed a bit more. I used parmesan instead of protein powder. I also ran my almond flour through a sifter to avoid the dreaded gluten free Sandy texture. I think it is the cheese that gives it the gluten like texture that I miss with so many recipes..Hubby liked it as much if not better than the homemade full carb full gluten crust we use to make on the grill back in our gluten days. I miss those days :( so thank you! !!!!!!! I saw the edge of yours in the photo and tried to duplicate it. I took pictures of it each step of the way it was so pretty. I just made this for dinner. It was just like having pizza again. My husband said it was “great”. Next time I’ll leave the crust in for the full 10 minutes. I got worried when it started to brown so quickly. I love your website. Thanks for being out there. Jane from Ottawa. I just made this tonight, as a Valentine’s gift for my diabetic husband, and it came together very well. I made one 12″ crust, but mine did not have the edge yours has and my crust was almost black by the time it was all done and tasted quite dry. The pizza itself had an excellent real pizza taste! Love the recipe, but am wondering what I can do so it isn’t so dark/dry. (I did bake it on parchment, but on a pizza pan with holes.) thank you for the recipe. Thank you, Kim. I do think the first browning was too much, maybe too high temp, or too close to the bottom. I was worried about it being soggy, but don’t think that’s a problem. Will remove it earlier next time will definitely roll the crust, it looks more like real pizza. My husband was thrilled…I’m more the critical one. Thank you for the recipe, it was easy to do. It’s tough when you’re diabetic. He’s lost 27 pounds in four months, so I thought he deserved a treat. He’s really missed pizza. My family loved the pizza tonight! I thought I’d get all fancy and make it a stuffed crust pizza. Sounds great, huh? Yeah, there’s so much cheese in the rest of the recipe that the cheese in the crust wasn’t even noticeable. Anyway, the husband says it’s better than take-out (and wants to know how often I can make it) and my 14 year old said it was “good.” Do you even know how high a praise “good” is to a teenager?! This recipe is definitely a keeper! How stupid. You post a supposed “low carb” pepperoni pizza without appropriate measurements. I am suppose to be on a low carb diet but to manipulate people like this just to get subscribers is crap. Makes it hard to give you any kind of rating. Well responded. Some people just lack manners. Rather than asking for the information she needs (or using her brain to work it out), she relies on insults. This is a FREE recipe! How is that charging someone?! Keep up the great work and let negative people and their attitudes flush away like a bad meal. I think the problem here is that you’ve given too many possible ways to measure out ingredients. You should clearly just draw pictures of measurements. With crayons. Words are just too difficult for people without brains or the understanding of how to use a coffeemaker to get their much needed morning caffeine. Less ‘splaining and more drawing. It’s the secret to happiness. Oddly enough, it’s also the secret to stupid. Go figure. Please, be respectful. This is a service that she supplies free of charge. No need to call others names. Lots of other recipes and places to look if this is not meeting your low carb needs. No need to be so rude. Not sure what you mean Bea by “supposed low carb pizza” because this pizza IS low carb. There is no flour & she specifies no sugar added sauce. The measurements & ingredients are very similar to the cheese, egg, & almond flour crust you’ll find in every other low carb blog. Bea, your comment is completely unfounded & unnecessary!! There is this thing called the Internet. Maybe you have heard of it? You can try using it to look up the GIVEN measurements to suit what you need. Everyone is just trying to do their best. So instead of being nasty, why not just ask for what you need; OR better yet, look it up yourself (you know – fact check)? Then, make a suggestion. Should Kim also wipe your nose for you, too? The nature and tone of your comment is absolutely unhelpful. It makes people question your intelligence. Kim, I totally do not get what this poster is commenting about. Your recipes are VERY clear and they work. I think sometimes simply have a need to be mean. Like you, I hope they have a better day and enjoy your recipes and all the work you put into them. What in heavens are you talking about? The measurements are all there. This is such a wonderful site with wonderful recipes and most of us really appreciate all the work Kim puts into these recipes. You need to rethink how offensive you are. If you would have just let anyone know what problems you are having with the recipe, anyone would try to help. Personally, I much prefer my recipes in weighted measurements, but it looks like you have everything here. Perhaps you don’t know how to read a recipe. This recipe is indeed low carb. Measurements are all there. It is also delicious and could not be any clearer in the recipe. What a shame that you can not see this. Now I wonder who the stupid person really is!! How rude of you to post such nonsense! Oh I could make this for din but no whey protein powder. What happens if I don’t want to use protein powder? Gonna gave to make this real soon! Been craving pizza. I’ve been making the fathead pizza dough for over a year, it’s good but wasn’t quite right. I saw this online a couple days ago and figured I’d give it a try. O.M.G! Thank you, thank you, thank you! This is the best low carb, grain free pizza dough I’ve had since going low carb. I feel like I had REAL pizza! Can you make this without the wet protein? I made this pizza tonight, using the double boiler method for melting the cheeses that you suggested – it worked really well! I let the cheese cool down a bit before working in the egg so that it didn’t end up scrambled. I don’t have any protein powder so I used the extra almond flour mentioned in an earlier comment. The dough wasn’t too difficult to work but it wasn’t easy to roll out thinly, I used the parchment paper to roll it out. I wonder whether using a little more liquid would help to balance the extra almond flour? I was surprised how quickly the base browned in the oven, definitely need to keep an eye on it and not stray too far from the kitchen for that stage! The final result was tasty but it did have that distinctive almond flour taste. The texture wasn’t too bad though – perhaps both would improve if I’d used the protein powder? Next time I make it I’ll make the effort to source some – is it the same as the one that people would use for body building? I’m so happy to have an edible low carb substitute for my usual Friday night treat. A huge thank you for providing the ingredients in grams as well as cups – this was a massive help as I’ve really struggled to find a reliable conversion tool for other US recipes and there aren’t many UK-based low carb bloggers out there. Thank you for the extra info, I’ll definitely be making this again so I’ll try the protein powder and oiling the parchment. I just made this pizza crust, and it was AWESOME. This is definitely my new favorite low-carb crust! Thanks SO much for sharing this wonderful recipe! What an ingenious idea! I love cheese so this recipe sounds heavenly to me… Only problem I have is that I don’t have a microwave to soften the cheeses – do you have any suggestions for how I could do that step? Thanks in advance from the UK! Thank you for your reply, I will let you know how I get on! Have you ever tried putting the melted cheeses into your Kithen Aid mixer then adding the egg and letting the mixer do the work? Love the crust hate the work! Hi Terri. I’m not sure what your comment is addressing… Are you referencing the cheese? I measured the cheese, then weighed it in ounces. I usually use Google to do the conversion from ounces to grams. This looks delicious! Is there anything I could use instead of the protein powder? Fabulous! I have made calzones with this dough also. My husband loves it! Kim, I will be the first to say that I am an official, nay, high-ranking official of the Cheese Lovers’ Club. Haha. 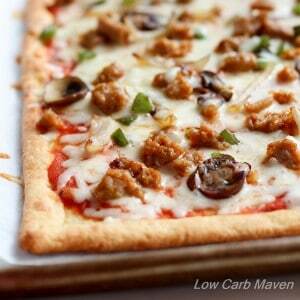 I have to say, your photo of this low carb pizza just had me at first glance. That perfect crust and those generous slices… girl, I could use some of this like, RIGHT now. Well done on making it low-carb too! It’s super impressive that you made a crust OUT OF CHEESE!! Woah. Great recipe & great pics. P.S. It’s so nice to meet you. :) Can’t wait to explore more of your blog. Pinning! Life and lack of organization happens to the best of us, Kim, so don’t fret! Plus I think you totally made up for the lack of posts with this cheesy deliciousness! Drooling over here!! And I love that this pizza is low carb, definitely means I can eat the entire thing… right?! ;) Cheers, friend! I am a cheesehead! haha I love pizza but certainly don’t need all the carbs — I’m more about the cheese and toppings. This looks perfect! we Love this crust! wondederful!!! !